Drew Brees is the 2009 Super Bowl MVP-winning quarterback for the New Orleans Saints. 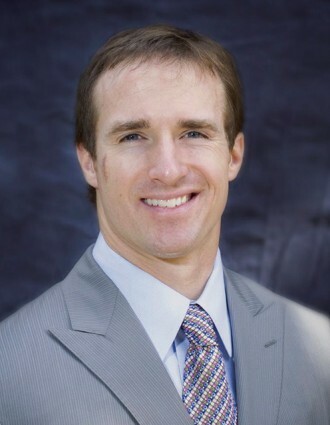 A native of Austin, TX, Brees attended Westlake High School and led his football team to a perfect 16-0 record and the 5A State Championship while garnering 5A Offensive Player of the Year honors. He attended Purdue University where he earned a bachelor’s degree in Industrial Management from the prestigious Krannert School of Management. A two-time Heisman finalist, Brees led the Boilermakers to a Big Ten Championship and Rose Bowl appearance during the 2000 season. In that same year he won the Maxwell Award as the nation’s top collegiate player as well as being named Academic All-American Player of the Year and was a recipient of the National Football Foundation’s postgraduate scholarship. He still holds virtually all of the passing records in the Big Ten. In his professional career he has been elected to seven Pro Bowls while being named 2004 Comeback player of the Year, 2006 All-Pro Team, 2006 Walter Payton NFL Man of the Year, 2008 and 2011 NFL Offensive Player of the Year, and Super Bowl XLIV Champion and MVP. As much pride as Brees takes in his on field performance, he takes even more pride in his community service endeavors. Drew and his wife, Brittany, established the Brees Dream Foundation in 2003 and since then have contributed and/or committed over $17,000,000 to help improve the quality of life for cancer patients and provide care, education and opportunities for children and families in need. In New Orleans, he has become “an athlete as adored and appreciated as any in an American city today.” When Sports Illustrated selected him for the 2010 Sportsman of the Year award, it was in large part for his leadership in helping lead the city of New Orleans’ rebirth after the tragedy of Hurricane Katrina. As a part of that effort his Foundation worked to help rebuild and restore and recreate academic and athletic facilities, parks and playgrounds, after-school programs, mentoring programs for the intellectually disabled, neighborhood revitalization projects and child care facilities in New Orleans. In addition Drew sponsors the Rebuilding thru Brotherhood program to invite fellow Sigma Chi members to the New Orleans community to build homes with the Habitat for Humanity. Drew lives with his wife Brittany and sons Baylen, Bowen and Callen in New Orleans.